THIS BOOK IS INTENDED FOR STUDENTS OFFERING ORGANIC CHEMISTRY AT ADVANCED LEVEL (COLLEGES AND UNIVERSITIES). 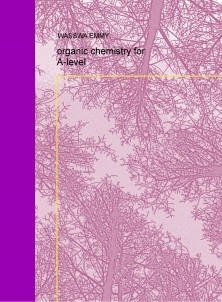 IT CONTAINS A SUMMERISED OUTLINE OF ORGANIC CHEMISTRY NOTES, EXAMPLES AND EXERCISES WHICH ARE OF VERY MUCH IMPORTANCE TO THE STUDENT.IT CONTAINS ALL THE CONTENT REQUIRED FOR EVERY BEGINNER OFFERING ORGANIC CHEMISTRY IN A VERY GOOD ARRANGED FORMAT. I KNOW THAT IT WILL BE OF VERY MUCH GOOD HELP TO EVERY READER. FOR HELP TO HELP IMPROVE MY BOOK PLEASE EMAIL ME AT emmy.wasswa@yahoo.com or call me at +2567773828272.